Because the fruit from our orchard blocks is rushed to state-of-the-art storage and packing facilities on-site, we think the taste and crispness of our FirstFruits produce is just about the best available to the market. We have a total of 105 controlled atmosphere rooms on site ranging in size from 700-bin to 4,160-bin capacity. The average sized room can store approximately 3,000 bins containing about 500 million apples. There exists a big advantage in the use of different sizes of controlled atmosphere rooms. Small rooms are ideal for storing varietals that have short market windows. 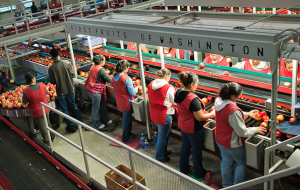 Larger rooms make it possible to deliver fruit from one orchard lot and provide a high degree of product consistency to customers involved in promotions. We are proud of the new ideas and technologies in place at our facilities to make our storage rooms more efficient and able to provide consistent quality for our customers. FirstFruits is one of the first companies to implement centralized computer-control of the controlled atmosphere rooms. Our system lets us control the temperature of each room to within a tenth of one degree. This system also gives us control over the nitrogen, oxygen, carbon dioxide and other gases in the atmosphere in each room to within a tenth of a percent. The system monitors the temperature every 20 seconds, and if necessary, adjusts the atmosphere levels every 20 minutes. Our first packing line, installed in 1987, was one of the most innovative in the industry. Since then, we have made many changes and upgrades. Our new 200,000 square foot packing facility features a state-of-the-art specialty consumer packaging line and is one of the most modern facilities of its kind in the world. Beyond the technology, the biggest advantage of FirstFruits produce is the fact that the grower and packer are one in the same: the storage and packing facilities are all on-site at the orchard. This results in higher quality fruit, as apples that were on a tree that morning are under controlled atmosphere that night. Fruit is picked and stored more quickly than what is typically seen in the industry, resulting in a better overall product for customers.